As a member of the Western Paradox church I propose a party. Admission only with an invitation. Invitations available inside the party. Neil_Boekend wrote: As a member of the Western Paradox church I propose a party. Admission only with an invitation. Invitations available inside the party. Since I'm not a member of the western paradox church, it only follows that me (and other non-members) will be the only attendees, correct? I'll be there, and I have to go coma. azule wrote: Time to succumb to coma and wake up in the past. I may not be reliving the same day over and over again, but being stuck in the past feels just as daunting. "The regular early morning yell of horror was the sound of Arthur Dent waking up and realizing where he was. It wasn't just that the cave was cold, it wasn't that it was damp and smelly, it was that it was at the centre of Islington and there was no bus due for twenty million years." Jein... that's an observation platform. They are building an amusement park. Just wait for it. Kethryes wrote: This page (304) shall become the Not Modified Page. Edits are strictly forbidden on this page! Last edited by Flado on Fri Apr 12, 2013 8:07 am UTC, edited 2 times in total. This demonstrate that the Topic is circular! This page (304) shall become the Not Modified Page. Edits are strictly forbidden on this page! 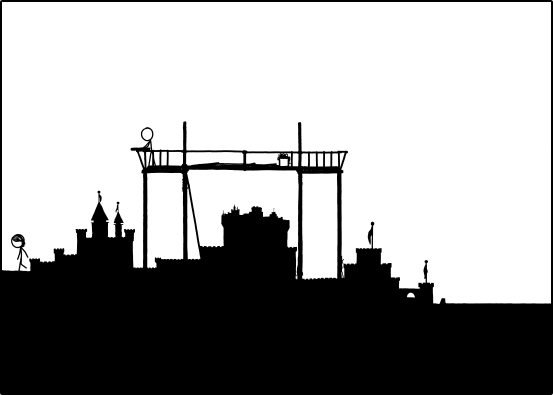 It's starting to look like a ship to me, with flags flying from the funnels and now the crow's nest, are they getting ready to sail off into the sunset? Are my eyes failing me, or did the sea rise accelerate? Woah, in the name of the great Randall, what has happened - I am comatose for a few newpix and suddenly they are building a ship - time flies. And so must I, since I'm an entire newpic late for dinner. "I'm the king of the sandcastle!" Thrice-weekly reminder: New Other Comic's up. azule wrote: OnTopix [new word coined, please use]: The Megan wiggly ladder incident is actually her handing Cueball the first long stick thingy. When you pass something above your head it is usually a bit unwieldy, not because it's heavy, just...because. Ooh, I know this. If you hold a thing above its centre of gravity, there is a stable equilibrium with the c.o.g. directly below the pivot (i.e. the place where you hold it), so it will tend to head back to that position if disturbed. There is an equilibrium with the c.o.g. directly above the pivot, but it's unstable and any slight disturbance will cause it to fall towards the stable equilibrium. To keep it in the unstable equilibrium requires a feedback loop (which can be implemented using the human brain) making constant corrections (e.g. small movements of the pivot). The need to do this all the time is what makes it "unwieldy". Re the bibel/babel: surely the One True Comic represents the revelation itself, and what is proposed is to present this alongside our mortal and imperfect commentary (exegesis?) on it. So it's more akin to the Talmud of a certain Outsider religion, and should therefore be entitled the Timelud or something. Quest progress: 223 out of 303 pages. Edit: updated through last frame, where the sea level rises a bit more. Last edited by mscha on Fri Apr 12, 2013 10:04 am UTC, edited 1 time in total. BlitzGirl wrote: The Madness has ended, but the madness that pervades this thread persists, as it has for all Time. It is a constant in my travels, and I have come to find it comforting. BlitzGirl's posts are somewhat reassuring. I hope she makes it! I wonder where they'll float to next? iisjreg wrote: B/D/Gong ! Seriously, 26 Minutes !? I'd already posted before I realised it wasn't up, and seen as this is page 304 and editing is banned I was in a pickle! I hereby make it known, that I, manvandemaan have created a local Sandmasonry chapter. Valiant Cookie wrote: Whatever is chosen, on the inside of the back cover should be a command, the command that Lord Randall would see every time he read the book and reached the newest OurPix. "Wait for it." Valiant Cookie wrote: I had a couple of suggestions for names a few newpix ago, "The Past", "The Book of Time", "How to Build a Sandcastle". I'll also suggest in tribute to our valuable resource, "The Book of Aubron". of those "The Book of Time" sounds the best to me. It is quite direct and to the point but still has a big hint of deeper meaning in it. orthogon wrote: Re the bibel/babel: surely the One True Comic represents the revelation itself, and what is proposed is to present this alongside our mortal and imperfect commentary (exegesis?) on it. So it's more akin to the Talmud of a certain Outsider religion, and should therefore be entitled the Timelud or something. Exegesis is an interesting word. "Exegesis of Time" seems like quite a good name for it too. Not many people would know the word without the help of a dictionary though. An exegesis of the Bible is someone adding explanation about the Bible and so by naming it Exegesis of Time it implies that the Time comic itself is the Bible and it expresses the nature of the book well. And we also have the Babel as suggested earlier. This name does imply that it is just babbling about time which is kind of appropriate but may not be to everyone's liking. I'd say take it to a vote but I don't see an obvious way to set up a vote on a forum like this. Could link to an external vote site I guess. So sorry, it looked red on my screen, and I did want you to get in any trouble. And, there are those who would define pink as a shade of red. On the subject of boat/platform, they appear to have placed additional planks on top of the original planks, so maybe they are building a boat on top of their platform. It's gotta be a lookout post of some sort — the kind you might find around castles or forts — if not a derrick or trestle for something. Edit: fixed the link, much later than I should have. Last edited by SBN on Fri May 03, 2013 11:12 am UTC, edited 1 time in total. Babel seems to be more an appropriate name for this needle-pulled-thingy. Congratulations on reaching the First Signpost! This historical moment shall be remembered in the Chronicles of Time! The Time when the future meets the past in the present is aproaching! Repent! Edit: Also the time of the Not Modified page is past (Thus I can edit), we enter now in the Use Proxy page! Edit2: Also be warnned, the next page (306) Shall be the Unused page! When it will be reached you shall send only empty posts, or risk to be cursed for seven generation! Last edited by Kethryes on Fri Apr 12, 2013 11:17 am UTC, edited 4 times in total. I think my 16-year-old daughter may have hit the nail on the head. She thinks they're building a tiki hut up on pilings. Is it just me, or has the sea outside Megan's marker / dike / sentry box actually begun to rise above the sand within? Last edited by jjjdavidson on Fri Apr 12, 2013 11:37 am UTC, edited 1 time in total.